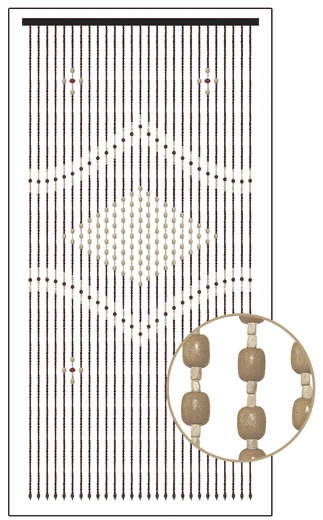 Wooden Bead Curtain - Genie - Tan Center - 35.5" x 69" - 27 Strands of wooden beads in irregular shaped squares in light beige and dark brown, accented with cherry red and tan circles. The pattern is simple yet interesting, making it easy to fit into many Decor styles. The header rail is dark brown and has 2 eyelets for easy installation. Each strand is finished with a wooden bead, giving a nice finished look. 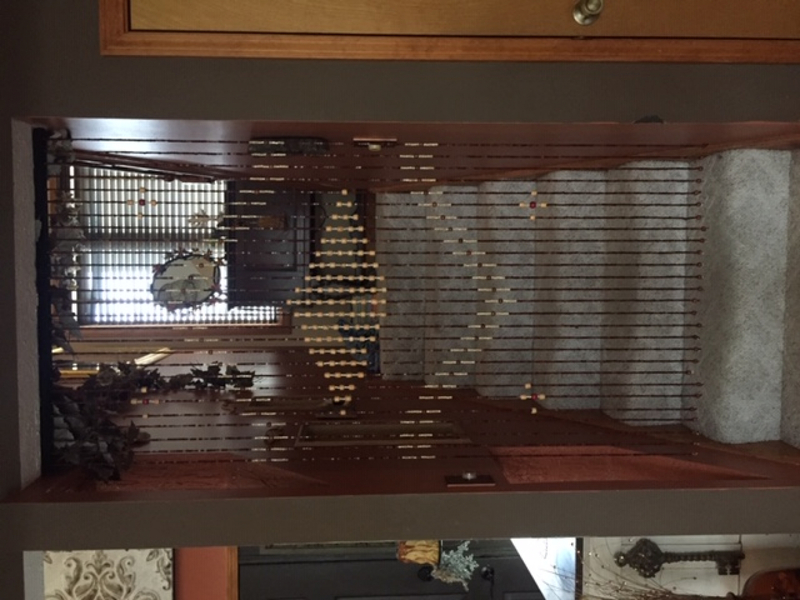 I chose this beaded curtain to go on my stairs. I just wanted it to look cool when you were sitting in the family room, but not actually block the view of the stairs. That is why 27 strands was perfect because you still get the vibe without blocking the view. I love it! Color seems to slightly darker in person compared to the picture. Regardless love them, my home is much more boho. Item arrived in great condition, and looks so nice in our doorway. The beads were very easy to put up. They are weighty and they look expensive - not cheap in the least bit. I'm so excited to have them! Looks nice and holds up well to my kitten playing with it. The wooden beads were very nice looking and had the tropical hut look i wanted. The beads are strung through a wooden support that i had to alter because my door was slightly smaller than normal, but that is in no way a bad reflection of this product. I will very likely order another. 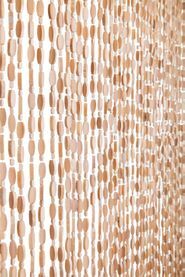 This bead curtain is so beautiful! It give my home the perfect touch. I can't believe the amazing prices either. I will certainly be coming back to ShopWildThings for future purchases! I was pleasantly surprised to see how well made this is, considering the low price. Hung it in the doorway of my laundry room, and wow, it really looks cool. Might be a throw back to the 70's, but it's unique and adds a really nice touch to an otherwise dull area.